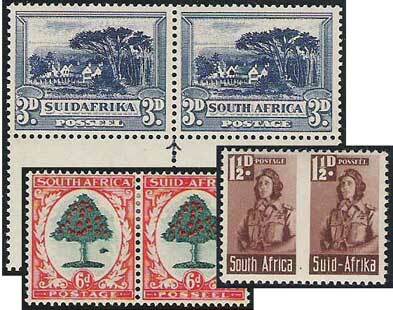 Collectors of KGVI stamps often pay little or no attention to the issues of South Africa. Some collectors believe they are too complicated to sort and identify, others simply don’t like the stamps, as most do not bear the image of the King. Whatever you may think, don’t let the prejudices of other collectors put you off. The philately of KGVI South Africa is fascinating and very accessible. The rotogravure printing process employed for the production of these stamps lent itself to the unintentional creation of varieties both constant and non-constant. The long periods for which the same basic designs were used means there are a fantastic range of printings and shades to collect. The last set of definitives saw the printing process changed to include the use of a glass screen. The effect on the stamp design was to make solid portions of colour made up of tiny dots. This is easily visible with a magnifying glass. Looking at the Stanley Gibbons catalogue you would see that the period of issue of the unhyphenated & hyphenated definitive sets, 1930-45 & 1933-48, straddle the start of the KGVI reign. The screened issue, 1947-54 ends when Queen Elizabeth II had been on the throne for two years. As you can see, there is no neat or tidy start or end to the South African KGVI period of philately, hence the KGVI collector can choose where they would like to begin and end their collection. 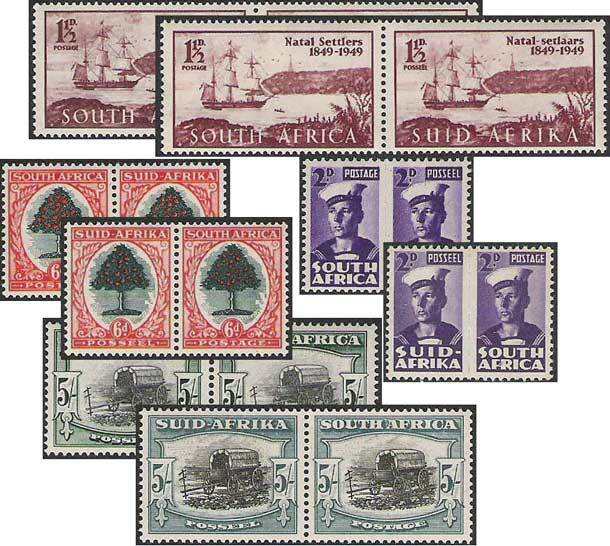 For dedicated students of printings and shades, the bilingual stamps of South Africa and South West Africa offer a unique collecting opportunity. The purchase of quantities of used singles is generally inexpensive, as these stamps are usually unwanted by collectors. The wide use of circular date stamp postmarks means many have visible dates to aid the ordering of issue. KGVI specialists love to collect varieties and South Africa offers something for all budgets. A look at the Stanley Gibbons catalogue shows a range from £5 for the 1947 Royal Tour 2d ‘Bird on 2’ variety, through to £28,000 for the 1930/45 3d blue centre omitted, which occurs on the September 1937 printing. There are many minor and not so minor varieties not listed by SG, I suggest that variety hunters look for one of the various “Union Handbook” catalogues to discover what exists. We have a large section of Bantam War Effort issues (from a specialised collection) in the single items section. Collectors of KGVI issues love these stamps for their minor and not so minor varieties. There are obvious ones such as the Stanley Gibbons listed ‘2/6’ flaw that occurs on the 2d and the ‘Bursting Shell’ variety on the 1s stamp. However the ‘2/6’ flaw only occurs on the first two printings, it disappears from later printings. Also, it can be found in both violet and red-violet shades. The propaganda slogans urging you to buy ‘Union Loan Certificates’ are an aid to identifying the different printings. They occur in similar colours to the stamps, later in violet or purple, finally they are replaced by numerals signifying the total number of stamps in the sheet. Note the ‘Ghost’ slogans that appear in the margins on printings of the 6d. They are especially noticeable on the third printing. The Official & Postage Due stamps should also be considered by the KGVI collector. The Stanley Gibbons Part I catalogue has an excellent listing of these issues. When deciding where to start a collection of these note that most of the Officials of the 1930/47 (SG O12/19) issues were in use during the KGVI period, although only the 2d blue & violet and the 2s6d blue & brown are included in the SG KGVI printed album. As the use of Officials ceased in January 1955, most collectors choose to go right through to the end of their usage period. The Postage Dues do not have a neat beginning and ending for the KGVI collector. However most of the 1932/42 issues (SG D22/29a) would have been in use for some part of the reign. The last set of interest would be the 1950/8 ‘hyphenated’ issue (SG D39/44), minus the 4d and 1s stamps. 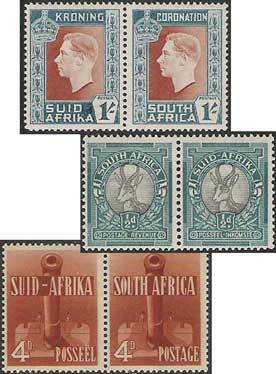 If you want to know more about Union of South Africa stamps read the Introduction to the Philately of South Africa and the Guide to the Philately of the Union of South Africa. For further information see “The Commonwealth King George VI Catalogue” published by Murray Payne Ltd.
“The Stamps of the Union of South Africa” by S.J Hagger, published by Reijger Publishers Ltd. in 1986 (also known as the Union Handbook – earlier versions were published in 1946, 1952, a Volume II in 1955, combined Volume I & II in 1960, 1979).